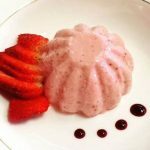 To make your Panna Cotta, (makes 4 – 6 servings based on size of cups used), puree the strawberries in a food processor and strain to remove the pips. Take about 1/3 cup of the cream and blend in the gelatin. Bring Strawberries, sugar and remaining cream to the boil and remove from heat. Stir in the gelatin mixture, salt and rose water. Lightly spray cups with oil, fill cups with mixture and allow to set in the fridge for6 – 8 hours or overnight. To remove from cups loosen the edges with a knife, turn upside down on your plate and holding the plate and mold tightly, give it a quick jerk. It might take a couple of jerks but you will know when you panna cotta releases itself from the cup. Decorate with fresh fruit and melba sauce.